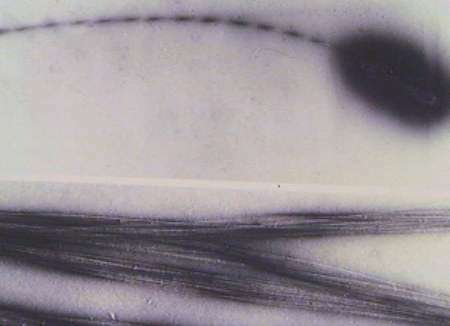 These photos are two electron micrographs of Acetobacter and the cellulose ribbons. The cells were prepared by a technique known as negative staining. The cells and cellulose are surrounded by electron-dense uranyl acetate which gives them excellent contrast. Note the twisting ribbon. This is independently confirmed in the time-lapse moves which show the cells rotating on their longitudinal axes as the cellulose is being assembled.